Heavy duty. Somewhat difficult to work with when connecting. IT IS VERY EASY TO LENGTHEN, AND EASIER TO SHORTEN. WISH THOSE TWO VIRTURES WOUD MEET CLOSER TO THE MIDDLE OF THE ROAD. Good product just wish it wasnt so memory retentive. Hard to get it to stay extended but storing is great. Worked well... just pulled out the legenth needed and I was good to go. 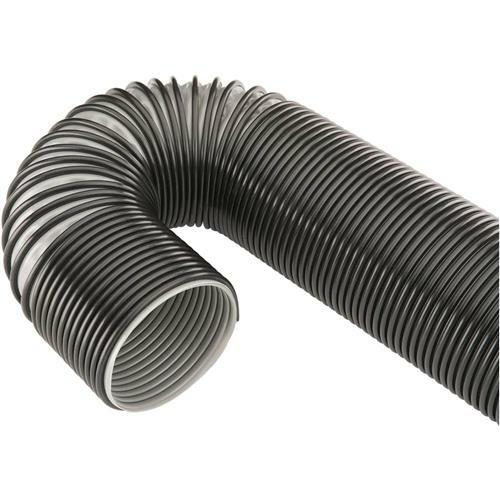 Order this hose replacement for my yard leaf vacuum and it works great. Delivery was super fast and ahead of schedule. Does as expected but sometimes a bit frustrating since it wants to collapse. THIS HOSE OFFERS SOME DIFFICULTY IN MOUNTING TO EQUIPMENT. CONTACTING GRIZZLY BROUGHT NO ANSWER IN HOW TO DO IT. LESSON LEARNED -----SPREAD THE ENDS APART WITH VERY STRONG FINGERS AND SLIDE ENDS ONTO CONNECTIONS. SECOND COMMENT, DON'T BOTHER WITH THE WIRE CLAMPS, USE THE BAND CLAMPS INSTEAD.